Separate the eggs. Beat the whites until they are stiff but not dry. Beat the yolks and sugar until they are light and fluffy. Add the butter and beat well. Add the lemon juice and rind. Fold in thirds the flour mixture followed by egg whites, ending with whites. Pour into a greased 13x18 pan. 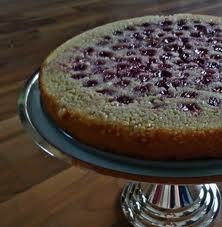 Spread butter over the pan and dot with cherries. Bake for 45 min at 350.